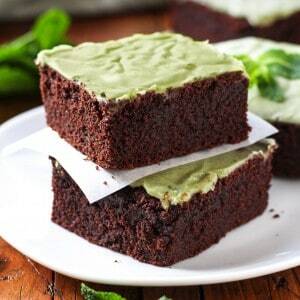 The rich chocolate flavor of this vegan brownie is balanced with a fresh mint glaze. Add chocolate chips for a more decadent dessert! Stir together all the dry ingredients in a large bowl. Make a well in the center. Slowly pour the almond milk and whisk until no clumps remain. Add the vegetable oil and whisk until it's smooth. Pour the batter into a greased 13-by-9 inch pan lined with parchment paper. Bake for about 25 minutes in the preheated oven, or until a toothpick inserted into cake comes out clean. Allow to cool. Spread the glaze over top of cake. Let sit in the fridge about 2 hours before cutting into 8 pieces. You can serve it fresh or at room temperature. Delicious topped with fresh creme anglaise.